Sitting is the new smoking! Too much of sitting can lead to obesity, aging and overall a deteriorated quality of life. It gets all the more difficult for people with 9-5 jobs as they have no other option but to sit at their desk and work for 8 straight hours. But, what they do not know is that there are many exercises that they can do right at their desk amidst all the phone calls, emails and deadlines. These simple exercises enable muscle movements without you having to get up! Check out these 5 ways to exercise at your workstation and get on to a healthy lifestyle or visit fit o’clock (the largest gym in Jaipur). Many of us sedentary workers have tension and pain in their shoulder and neck. Shoulder shrugging is a targeted exercise for shoulders and neck which releases the tension and brings the shoulder to its normal position. It is the exercise that enables movement of your abs muscles. You can do it while sitting as well as while walking. All it requires is some deep breathing so it can be a good stress reliever exercise, as well. Sitting for such long periods can cause a dip in your overall strength and flexibility. This exercise enables movement of calf muscles which in a way keeps your leg muscles moving without you having to get up. A bad posture while sitting can do a lot of damage to your core muscles. This is an effective exercise for lower back stretch. All you need is your work chair to twist and turn. Sit up straight and let your feet hover the floor. Stretching is a way of doing Yoga at desk. Doing it for just a couple of times will not only enable some muscle movement but will make you feel good, at the same time. Though there are many stretching exercises that one can do, but we have put one that is simple and effective, at the same time. Keep your palms facing upwards and then stretch. 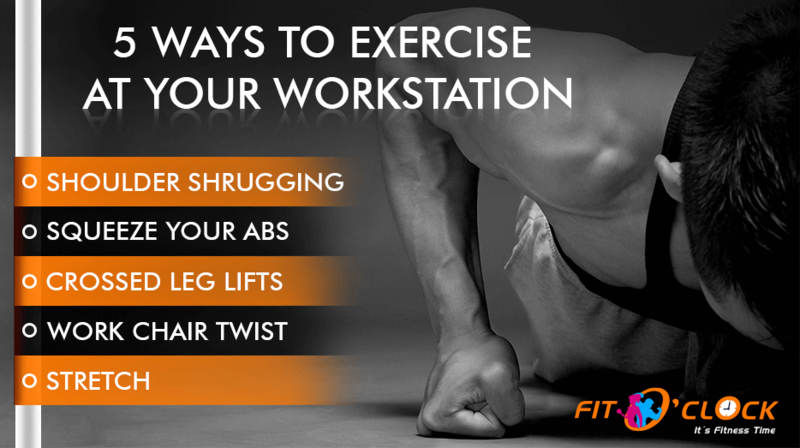 Even when you do your desk exercises, it is necessary that you join a Gym for stronger muscles and healthier body. Find a gym near your workplace and make it a priority to give at least 30 minutes there. There are several gyms opened in Jaipur in different zones. For example, search for Gym in Raja Park or Gym in Vaishali Nagar and you might find some good options for fitness clubs. Your style is so unique in comparison to other folks I have read stuff from. Many thanks for posting when you’ve got the opportunity, Guess I will just bookmark this blog.